Welcome to Decorating Diva, where every week we share fresh, fun ways to update your home and spice up your living space! Easter is around the corner (we’ve already started stocking up on chocolate eggs). But aside from the plethora of sweet treats, Easter also makes for a fun time to decorate. If you want to add a bunny-approved twist to your home, we’re here to help. Read on for some expert tips and tricks for stylish Easter decor. Easter is around the corner (we’ve already started stocking up on chocolate eggs). But aside from the plethora of sweet treats, Easter also makes for a fun time to decorate. If you want to add a bunny-approved twist to your home, we’re here to help. Read on for some expert tips and tricks for stylish Easter decor. Soft, eggshell hues might be the usual choice but there are more options for Easter color, Addison says. He suggests a few key shades to help create a stylish and Easter-ready home. “Bright and pastel colors are really big this season and are great options to make your home ready for Easter,” he advises. Quick tip: It wouldn’t be Easter without eggs, and dyeing eggs new colors is an easy way to reinvent the tradition. 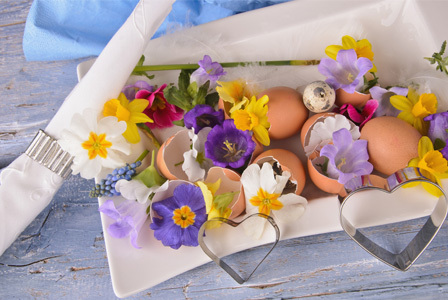 You can dye the shells of your eggs to match your decor color scheme, adding a simple twist to an Easter staple. Flowers are the easiest accent to transform your home into a bright re-creation of a garden – a look that’s perfect for Easter but doesn’t have to change post-holiday. “Bulbs are great flowers to use for Easter and easy to maintain through the spring,” Addison says. You can plant bulbs in a growing container at home as long as it allows room for the roots to grow. Place bulbs over at least one inch of gravel, depending on the bulb type, then completely cover the bulb with gravel and store in a cool, dark spot. As soon as you see the green growth above the gravel, move the bulb to a sunny area, he advises. If you don’t have a green thumb or time to plant, you can still keep the garden feel by using vases and colored gravel to contain gorgeous cut hyacinths and daffodils that will make your home “spring” to life. Addison is always tweeting his inspirations. If you need some more help or just want to see what he’s up to in terms of entertaining and decor, tweet him (@markaddison).